A teenager who was part of a gang that pelted a disabled woman with flour and eggs before posting a celebratory selfie online has been sentenced for his role in the incident. The shocking attack occurred last July in the UK county of Suffolk and involved five other teenage boys. The 17-year-old, who cannot be named for legal reasons, was found guilty of a public order offence on Thursday, Metro reports. The teenager was given a three month reparation order requiring him to do 24 hours of unpaid work. He was also ordered to pay the victim, 49-year-old Janice Morris, £150 (AU$280) in compensation and £640 in court fees. In an earlier trial, the teenager denied a public order offence, stating the victim was already covered in flour before he arrived, the publication reports. However, the court was told the 17-year-old was one of four boys photographed besides the woman — an image which was shared worldwide on social media. 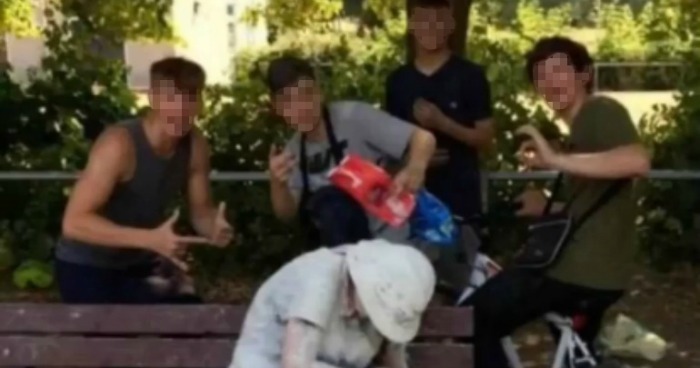 The viral photo showed the boys posing around the woman as she cowered on a park bench. Her body was covered in flour and raw egg. The teenager gave himself up at a police station after he saw the photo circulating on Facebook. “I just feel like I’ve matured a lot and I won’t be back here again,” he reportedly told magistrates at his hearing this week. Five other teenage boys admitted their role in the shocking attack at an earlier hearing in November, 2018. Four of the youths — a 17-year-old, a 16-year-old and two 15-year-olds — were sentenced to referral orders — an order available for young offenders who plead guilty to an offence whereby the defendant is referred to a youth offender panel. Meanwhile, 18-year-old Cohan Semple, who reportedly took the photo, was sentenced to a year-long community order. The victim reportedly told the trial that the attack left her feeling “a bit shell-shocked, a bit raw”, Metro reports. At the time of the incident, the photo and names of the underage boys went viral on social media, with many slamming the teens for their attack on the woman and issuing threats of revenge against them. Days later, The Telegraph reported the abuse and threats were so serious the boys were temporarily placed under police protection. What are your thoughts on this? Have you been following this story?